Why Start Feeding Birds in Fall? WANTED: BED & BREAKFAST - Family seeks winter lodgings, with regular meals; all-day buffet preferred. Central heating not required, but water a decided plus. Applications now being taken in your back yard. You might not see the above ad in your local newspaper, but wild birds are already making decisions about which back yards they will visit this winter. What you do as the days grow shorter lets the birds know that you want their business and invites them to come back when serious winter comes. People who don't start feeding birds until severe weather arrives may be missing out. Fall is the season to begin, even though natural foods are plentiful and the birds like the tufted titmouse above may not spend much time at your feeder yet. They are out in the fields and woods, feasting on seeds and berries and well-fed insects. The birds that do visit feeders in the abundance of autumn are scouting. They need to be ready when cold weather hits. The red-bellied woodpecker at left was well acquainted with our feeding station before winter arrived. Cold will increase their calorie requirements, right at the moment that food becomes harder to get. Insects stop flying and wiggling. Snow covers seeds. Ice seals away tree buds, wild fruits, and the insects that woodpeckers and nuthatches like to find under the bark of trees. So they need to be ready. That's whey they're studying their resources in advance. Noting where food is available. Locating alternatives. Taking inventory of contingent provisions. It's good to be included in their inventories. If the birds discover that your yard is worth visiting, they'll remember. And when that first storm hits, they'll show up. Hungry. Chirpy and chattery. Red and blue and black-and-white and yellow. Fun to look at on a snowy day. On the other hand, if you wait until hard weather arrives, the birds may not ever realize what you have to offer. Under the stress of freezing weather, they can't afford the luxury of exploring. They must go where they know there will be a payoff. They might not discover your feeder all winter, even though it is abundantly supplied. So start offering provisions now. Seeds: black oil sunflower, white millet, niger, safflower, cracked corn, broken nuts. Offer suet in hanging baskets, for woodpeckers. You can try some chopped up fruits. Don't worry about them if you have to be gone from your home for a while in winter. Birds are used to having a food source disappear. They won't starve because of your lapse. It might take them a while to rediscover your yard when you return, but they'll be back. One of the best ways to get the birds into your yard is to provide unfrozen water, replenished daily. Sometimes water is harder to come by in winter than food. 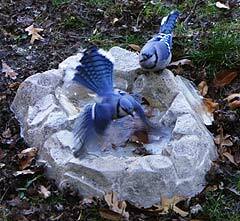 The blue jays at left are drinking from the opening in the skin of ice on this bird bath. When the temps stay below freezing, some kind of heater is needed to keep the water unfrozen. You can get a heating element that soaks in your bird bath and turns on whenever the water begins to freeze, or purchase a bird bath with the warmer built in. One of the best such designs I've seen is a plastic bath so light that you can lift it with one finger, but which looks like a boulder with a natural hollow for the water. OK. You'll feed the birds. What birds will come? You'll attract the birds of your own region. A New Yorker's feeder will have northern cardinals, while someone in southeastern Arizona might get pyrrhuloxias (especially at dusk). If you have some thick trees such as evergreens for shelter in your yard you'll probably also attract chickadees, titmice, nuthatches, and woodpeckers (such as the downy woodpecker at right). In each part of the country you'll get species characteristic of your region. Generally you'll attract the most common species of your locale. What the best kind of feeders to use? You can go simple or elaborate, depending on how much time, money, and space you have to devote to the subject. All of the following work. Most people who feed birds do several of these things. The simplest is just to toss the birdseed on the ground. Many birds, such as the white-throated sparrow at right, enjoy eating at or near the ground. This one is actually up on a decomposing stump, where I had scattered some white millet. A step up is to put it on a porch railing, where it won't get so dirty. Better yet, put it under your eaves, where it won't get wet, either. One of the most successful feeders we've used was a coconut shell that my father hollowed and wrapped with wire. We suspended from a tree. The chickadees loved it! A variety of feeding locations will bring you more kinds of birds than a single feeder, because each species will find its own preferred level and location. If you want to get more elaborate, you can sink a post into the ground and mount a platform at the top. Put a bit of molding around the edge to keep the seeds from rolling off. Let the molding leak at the corners so that the feeder doesn't fill up with water. You might want to buy a hanging tube feeder with small holes for thistle or niger. Whatever you use, be sure to put your birdfeeder where you can watch the birds from where you live. Enjoy the chirps of chickadees while you're eating. And start now. You'll enjoy the birds all winter long. Hanging feeders help keep the birdseed clean. That's healthier for the birds. One of our favorites is the No/No Cardinal Feeder. All metal. No wood or plastic that squirrels can chew up. The mesh folds flat and expands to hold seeds. Bright red. Nice to look at. Easy to fill. The All Weather Feeder lets birds get at the food in all weather. Nuthatches love it, along with chickadees, titmice, and cardinals. Birds reach UP from a covered, sheltered platform below the feeder. It also protects the food from rain and snow. Seed stays dry. Snow and ice don't seal it away from the birds. Comes in 2 sizes: 4-quarts and 6-quarts capacities. 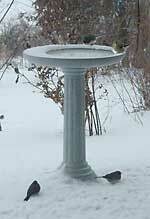 Our favorite winter birdbath is the Kozy Bird Spa heated birdbath. It comes with a pedestal, and the cord goes right up through the middle of it. The heating element is built into the bowl, and the cord plugs into it from below, down inside of the pedestal. This is a neat looking bath. Our birds love it. This photo was taken at Birdwatching Dot Com.